The universal law of sympathetic vibration indicates that forms with many similarities have more influence over each other than forms that are not similar. 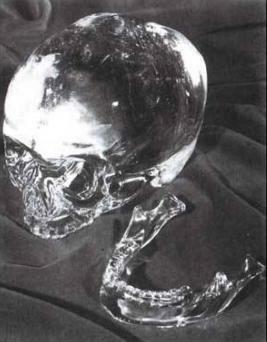 Therefore it is possible that the shape of a human skull would be high on the list of possible shapes to be used for a magickal consciousness altering artifact. There are respected ideas that the human form is "sacred" from a geometric viewpoint-that is it's proportions contain secrets and correspondences with particular numbers and ratios that in turn atune with particular cosmic energies etc. 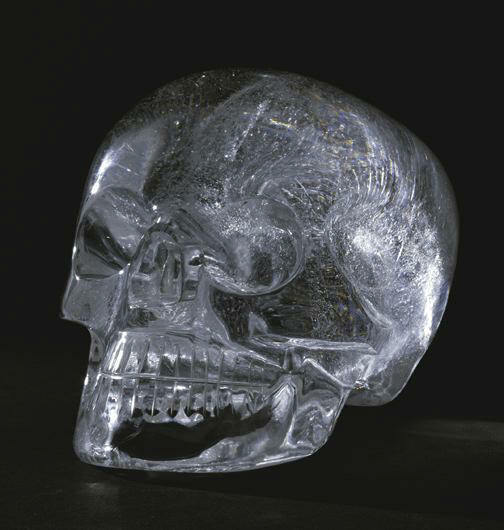 Therefore the maker of a crystal skull, knowing this much can harness the inate harmony of the body-in this case the skull-to attract or generate particular refined energies. In other words by mimicking the form of the human skull they can benefit from the wisdom of the body's designers without necessarily understanding it to the same profound depth. No two skulls are exactly identical in shape. The uniqueness of each skull reflects something of the characteristics of the being incarnated in the particular physical body. 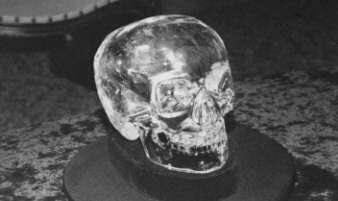 Was the crystal skull modelled on an actual skull from somebody who lived in the ancient past? If so who was that individual? It seems likely that if the skull had a model then the model would have been a great spiritual light, a guru or a mighty magickian. That being, before his death, may have comissioned the creation of the crystal skull for specific purposes. For example as a communication aid between his followers and himself though he be dis-incarnate. The purpose of the crystal skull may have been to be any instrument of power that the spirit of the model could use to effect the Earth. Worship of the crystal skull may have provided the energy for the spirit to utilize. All matter has memory and all matter resonates with particular energies. I think that quartz crystal has a very "accurate", clear and focused memory-making it ideal for the storage of complex ideas and information over vast periods of time. Some materials may radiate *particular* psychic energies-for example one of the four elements may predominate or the color of the material may correspond with a particular archetype. In this respect clear quartz is neutral and so is more like a blank canvas that can be moulded by the shape, astrological considerations and the directed will. Please cklick here for information about the number 13 that may be relevent to the crystal skull phenomena. The Mystery of the Crystal Skulls by Chris Morton,Ceri Louise Thomas.